get in touch Copyright © 2017 Moto Republik. All Rights Reserved. Designed by Uppercase. Moto Republik is the first creative hub in Zimbabwe. It was born from an idea: that young people in Zimbabwe need a space where we can meet, collaborate and dream big. Moto Republik consists of a co-working space for creatives, office space for young start-up organisations, a workshop room and an events venue. The hub is located in groundbreaking new architecture: double story refurbished shipping containers in the Greater Avenues area, Harare. Moto Republik is a space to create, to inspire and to change. We aim to be the change we believe in: by encouraging a community that is participatory, by being a space for cool new alternative media, by promoting an economy that puts people over profit and by embodying a society that is sustainable and green. Join the creative revolution! Moto Republik has hosted over 4,000 young people at its events, incubated dozens of creative start ups, is host to many of Zimbabwe’s leading creative and media organisations and is home to 50 young creative entrepreneurs on a daily basis. Moto Republik is brought to you by Magamba Network, Zimbabwe’s leading creative organisation. 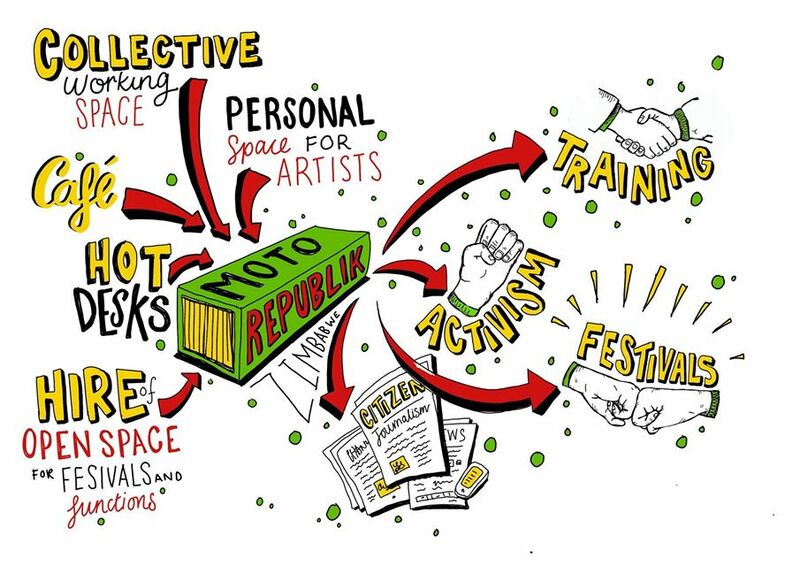 Moto Republik fosters a vibrant community of young creatives, citizen journalists, techies and youth activists with a focus on co-creation, mentorship and free expression. Moto Republik also provides events management for organisations and companies looking to host a cutting edge talk, launch or event at our vibrant hub. Make Moto your home and enjoy working in a dynamic, friendly atmosphere with inspiring creatives! We offer various membership packages ranging from Native (full time) to Creative (part time). We also have the option of Casual Membership and Day Passes. The zw9 program was a great experience for me in bringing out film production as a reality more than a vision. Coming from the formal sector into the creative industry, I really had no knowledge on how it would all work out. There was a lot of vital information too, but in a few words; I am privileged to be a part of the ZW9 Accelerator Program. I wish I had learnt the things I learnt through this program 3 years ago when I launched out as an independent film producer. The ZW9 Accelerator program has transformed my perception towards being an indie. Many thanks to Moto Republik and UNDP Zimbabwe for making this dream a reality series. I managed to get a freelance job in TV & Film while being a member of the co-working space, through the networking opportunities and events that take place at Moto Republik. I doubt I would have been able to get this kind of opportunity working anywhere else.